Alfie Potter admits the Cobblers players can’t believe that Nicky Adams was allowed to leave Bury. And Potter knows the Shakers’ loss is very much Town’s gain as the midfielder continues to impress in the build-up to the new Sky Bet League Two campaign. 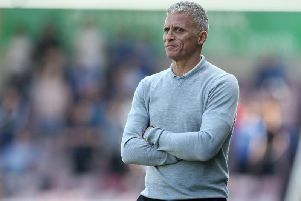 Adams was transfer-listed by Bury, who won promotion to Sky Bet League One last season, in May and Cobblers acted quickly to sign the attacking midfielder on a three-year deal. He has already shown his quality with a series of eye-catching pre-season performances, including in the 3-0 win at Brackley Town last Saturday. And Potter, who linked up superbly with the 28-year-old in that game at St James’ Park, scoring twice, said: “Nicky’s been unbelievable. “He scored two (in the 2-2 draw against Birmingham City) the other week and if I’d finished the chances he created last Saturday, he’d have had quite a few assists. “I’m thoroughly enjoying playing with him and he’s showed that he can definitely be one of the best players in our league. The Cobblers complete their pre-season programme with a trip to the oldest club in the world, Sheffield FC, tonight (Friday). Ricky Holmes, who hasn’t featured since the 5-2 win at Worthing last month, is set to play in the game.